We Want Your Donors To Have Top Scratch-Value! 1. Existing Coupon Sheet already set-up for your area (Will be included when you request your FREE sample card). 2. Double-up the better coupons. If some coupons on your coupon sheet are not good in your area, you may remove it and replace it with one of the better coupon offers. For example, if you don't have a Blimpie in your area, you may replace it with a second Pizza Hut coupon. Extra charge: Only $30. Bonus for using this service - 1 extra FREE scratch card with your order. Double-up as many coupon offers as you like! 3. Customize-it with Local Coupon Offers if you live in a more rural area where several of our offers are not available, you can now customize your own coupon sheets with local coupon offers. 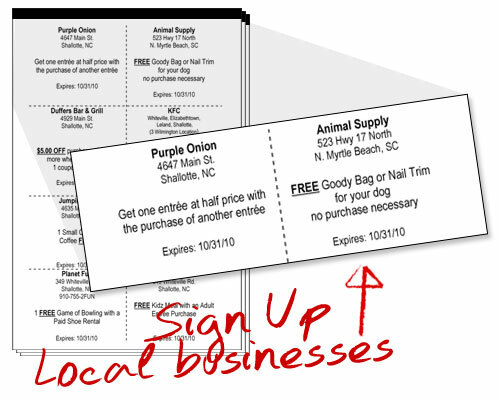 Call us and ask for our Local Coupon Agreement or print the agreement which you can use to sign up your local merchants. Please note that custom coupons are printed on yellow sheet with black print. Extra Charge: Only $30. Bonus for using this service - 1 extra FREE scratch card with your order. It's easy to sign-up 4-8 merchants in only one afternoon! If you have any questions about coupons, call us now at 1-888-800-9506 for a quick solution! "Skratchers, Thank you for introducing our basketball team to this great fund raising idea! We raised just over $2,000 in 2 weeks!"